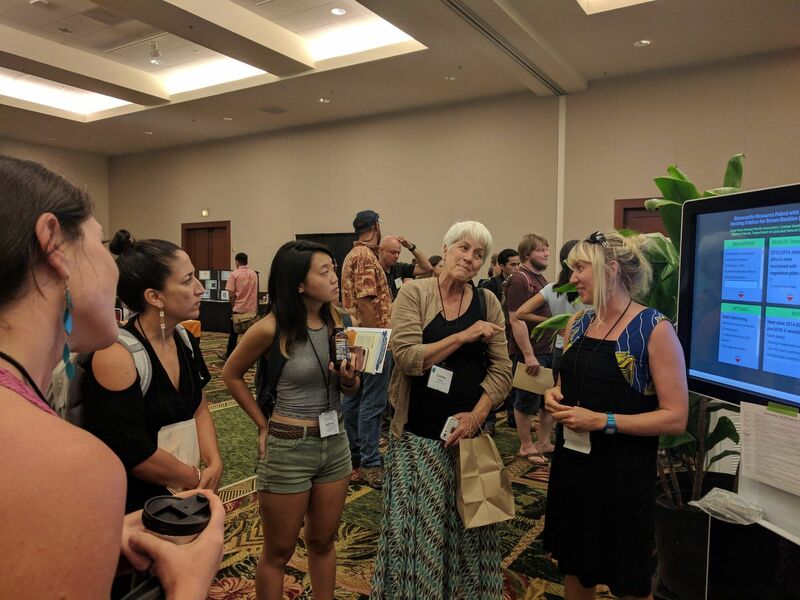 Seasoned Kure field biologist and Hawaii Pacific University grad student Ilana Nimz presented her poster at the Hawaii Conservation Conference (Pictured above) about the removal of the highly invasive weed Verbesinan encelioides at Kure Atoll and the subsequent Brown and Masked Booby population increases. The Kure brown booby population increased 14% from 2011 to 2017 during intense Verbesina removal efforts. The dense tall stands of Verbesina have been replaced with native low growing vegetation that allows for easy booby take offs (a few hops into the wind) and cooler summer nesting temperatures. Wind and open space are required for large seabirds such as boobies, frigatebirds, and albatross. Windless, closed in, hot nest sites cause seabird adults and chicks to overheat and sometimes die from this heat stress. If you want to understand the seabirds need for wind and open space try flying a kite in a forest. It can’t be done!